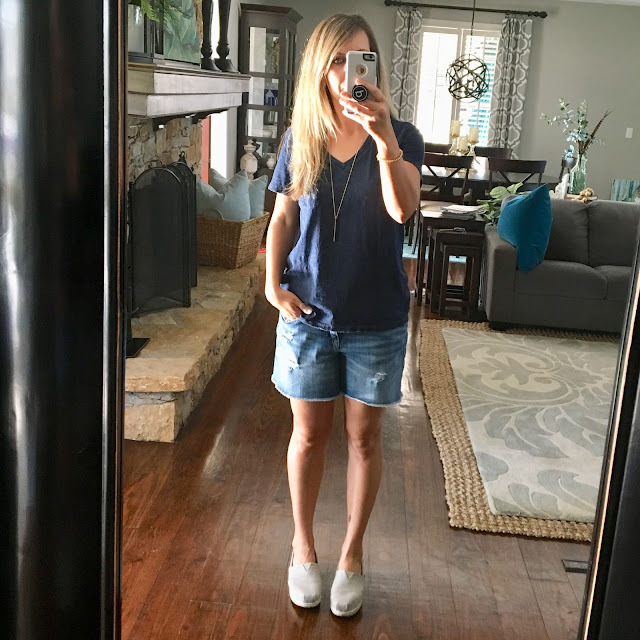 Midwestern Mama: Trying to Find the Right Denim Shorts is Like Finding a Needle in a Haystack! 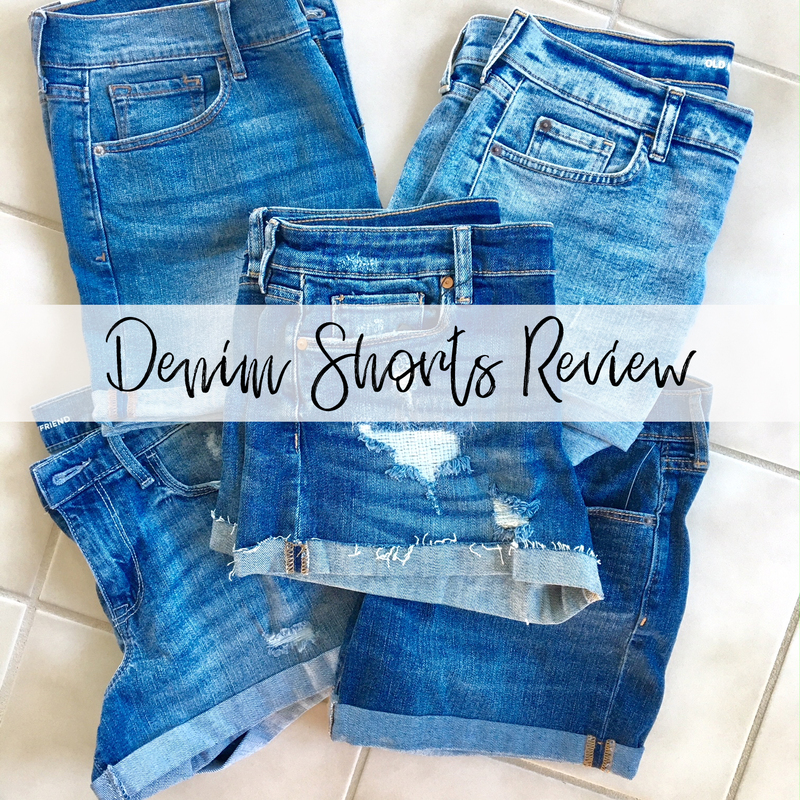 Trying to Find the Right Denim Shorts is Like Finding a Needle in a Haystack! You would think that getting a pair of jean shorts would be a pretty easy task. There are so many to choose from out there, but it's near impossible to find one that meets all of my requirements! If you follow me on Instagram, chances are you have already heard me talk about most of these, but I know there are a lot of you sweet readers who aren't on IG, so I wanted to share this on my blog as well! And with all of the Memorial Day sales coming up, I am sure most of these will be on major sale! 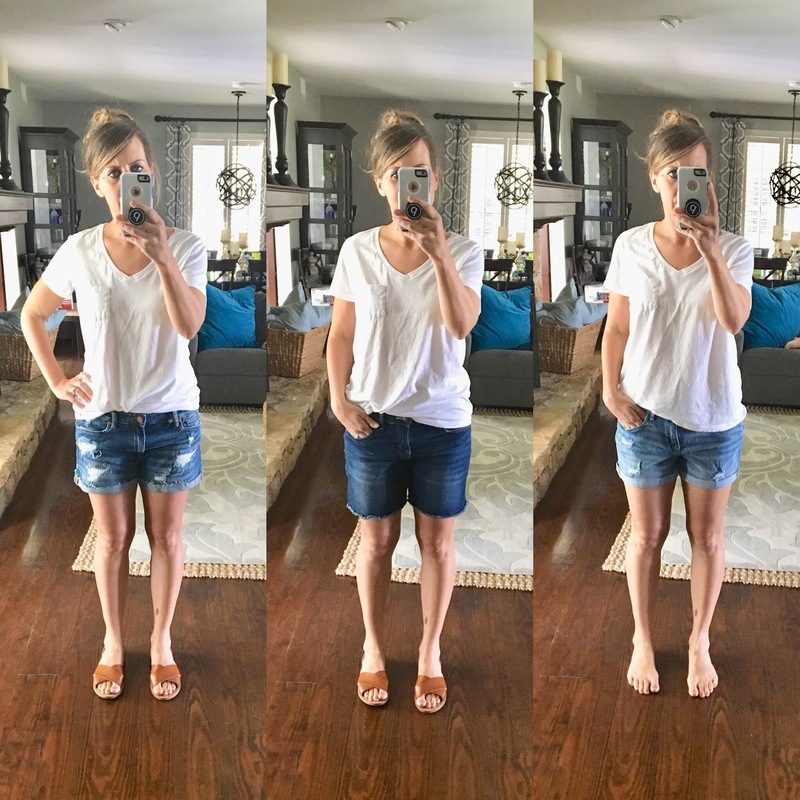 I have been ordering and sending back several different pairs of denim shorts over the past couple of months and it finally donned on me that I should be taking pics and sharing this with you because if we can help each other find a decent pair without pulling our hair out, then we have succeeded at something in life! 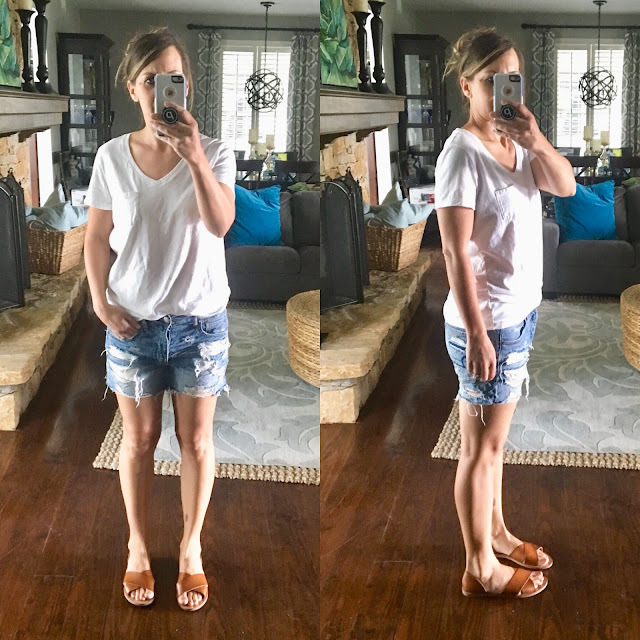 I am all about little victories, and a good pair of jean shorts has a way of making me smile! 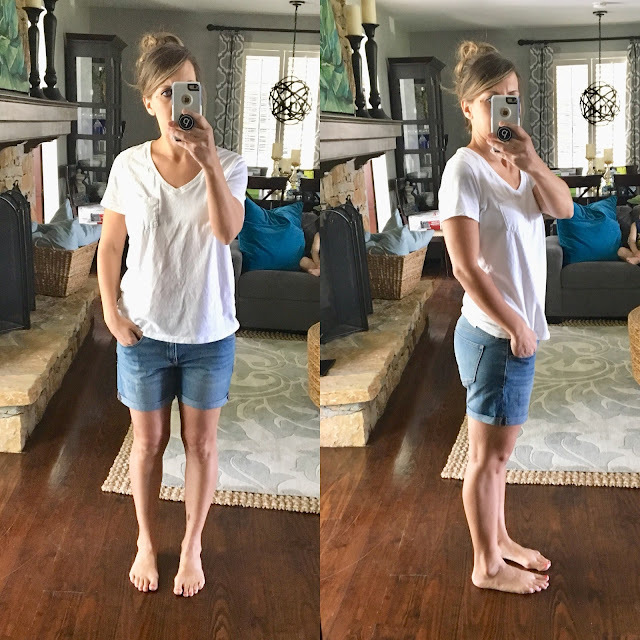 For sizing reference, I am 5'6" and usually wear between a 6 and an 8 in pants. I liked these a lot! If between sizes, I'd go down. They fit slimmer through the thighs, but they were not skin tight. I liked the length on me. I don't have a thigh gap, so I have to be careful that my shorts aren't too short or else they will ride up when I walk. Fun stuff right there, let me tell ya! The hem is rolled up twice and stitched on the outside and inside seams. These were not distressed and had a mid-rise fit. I could bend over without any plumber's crack issues! Hallelujah! This color is Dark Worn and they are regularly priced at $24.99 but we all know Old Navy frequently has sales, so watch out for those to snag them at a lower price! These are the exact same shorts as the pair above, except a different color and a larger size. Since I am between sizes, I often order two of everything because I never know which one is going to fit. The larger pair had a baggy fit, as you might expect. I could still wear them, but they sat lower on my hips and as a result, I would have to watch my hind region when bending over. I still liked them a lot, but I ultimately decided to stick with the smaller size. This color is Cabo. 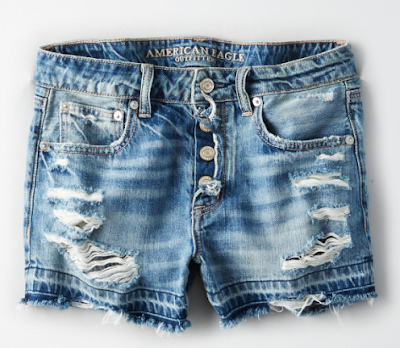 As the name implies, these are distressed, but not overly ripped. The holes were not revealing in any way. They have a slightly oversized fit, but I liked them that way and don't think I would have wanted to size down. The inseam was a little shorter then I usually like, but the hem is rolled twice and stitched just like the pairs above. I liked these a lot, and wanted to make them work, so I used my handy thread ripper to let down the stitched hem and that added another 2 inches to the length. Instead of a rolled 3" hem, they are now a raw 5" hem and I love them! Here they are after the hem was released. 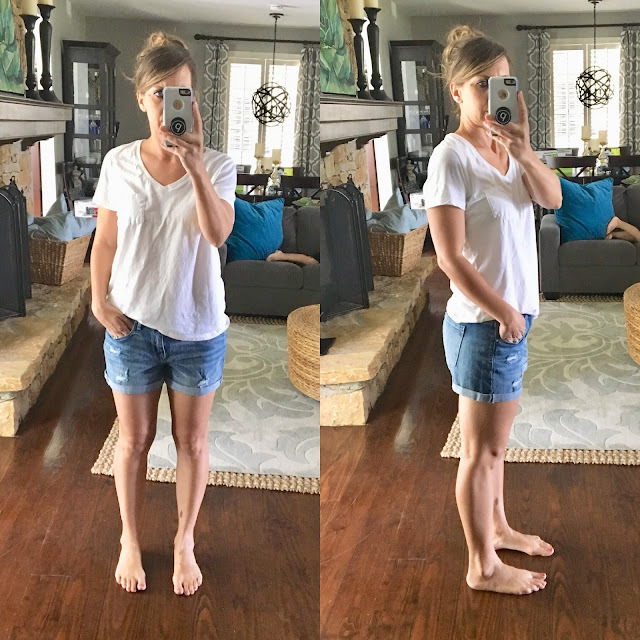 Don't be afraid to do a little after market updating to your clothes to tailor them to suit your body! I'd say these are a mid-rise and the back comes up high enough to avoid any crack exposure. I love these and am glad I ended up keeping them! These are the medium wash. These are a little bit longer, with a 6" inseam. They are not as long as a bermuda short, but somewhere between that and a regular short. They are not distressed, but they do have a raw hem. The hem is stitched so even after several washes, I have not experienced any additional fraying or white strings, as you would with a regular raw hem. They fit between a low and mid rise, but the back comes up high enough in my opinion. They are nice and stretchy but don't bag out by the end of the day. 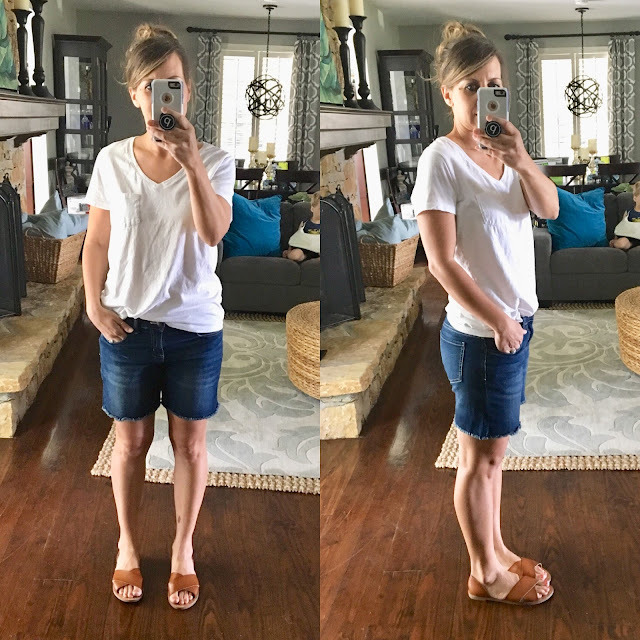 I like these a lot, and they are great for chasing after kiddos because you don't have to worry about anything being exposed while you are playing at the park with your kids. I loved the distressing on this pair! They had white patches behind the larger holes, so although they seem to be pretty distressed, they were not revealing. They have a raw hem, rolled up once and then stitched at the inside and outside seams. The material is thicker than the other pairs I tried on, but still plenty stretchy. They were definitely a lower rise and I could see my undies peeking out when I bent over. They are a higher price point than the others, at $68. These are my beloved Tomgirl shorts from last year. They were super distressed to start with, but they are about to fall apart because I wore them so much! A similar Tomgirl short is available this year with different coloring and distressing. I have not tried on this year's version, but last year's ran large, so I sized down to a 6 and still had plenty of room. 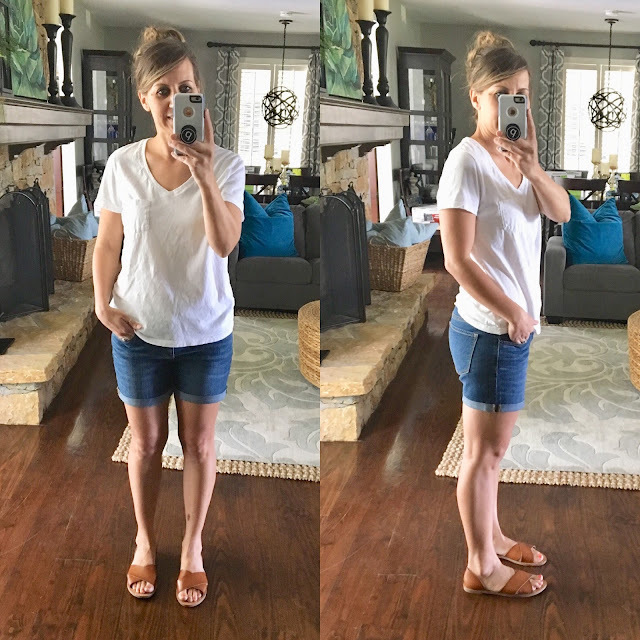 Mine are 100% cotton (and these are too I believe), so there is no stretch, but they fit so loose that it didn't bother me. The plus side of that is they didn't stretch out and I could wear them multiple times between washes. I tried on several pair from American Eagle, but didn't commit to any of them. They were either too short, too tight, too low, not stretchy, or gave me a severe muffin top. This was my favorite pair in the store, but they didn't have my size in stock. I liked the crochet pocket which peeked out under the distressing and they seemed like they would fit pretty similar to my Tomgirl shorts. 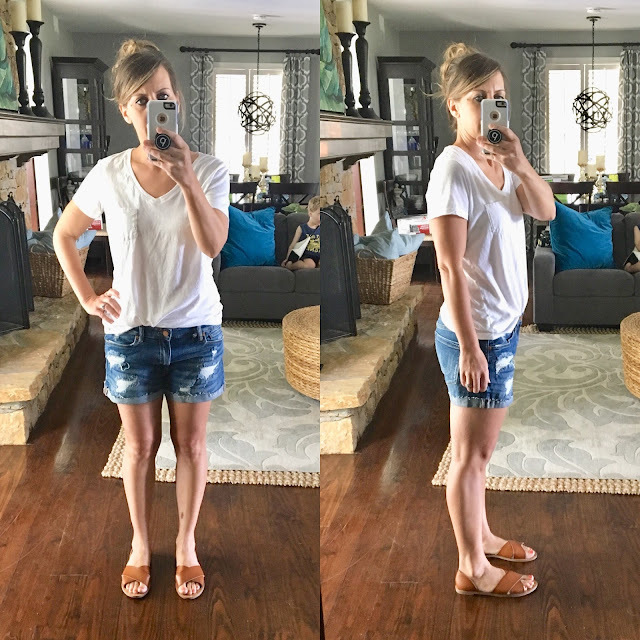 I also tried on a few pair of shorts from Loft, but I wasn't impressed this year. The material was thicker then I like and the crotch hung down and gathered funny when I walked or sat down. That's the thing though...we all have different bodies, so what works for me, may or may not work for you. But hopefully, this gives you an idea and helps ease the pain of finding a good pair of denim shorts for the summer. Because if you're anything like me, they are part of your momiform, and I couldn't live without them! Now it's your turn...what's your favorite pair of denim shorts? 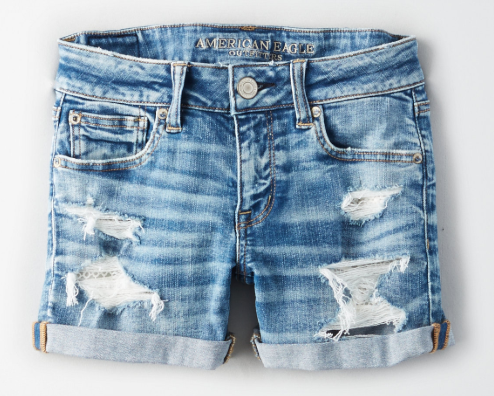 Do you like distressing or no rips? Some of the links in this post are affiliate links, which means I may make a small commission. Thank you for supporting my blog! Have You Ever Heard of Mother's Day?